There’s no mention of rising violent crime or Tony Blair’s £2bn raid on Mrs T’s rebate handbag. 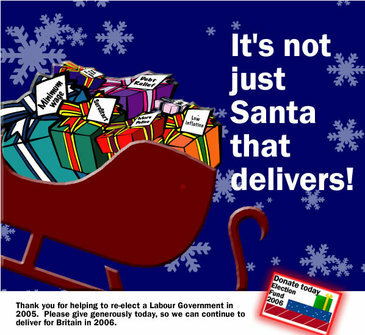 Labour’s gifts all look pretty insecure in that sleigh, too. One unexpected jolt and a few might fall to earth with a crash. And where’s Santa-lookalike Frank Dobson? I think we should be told.